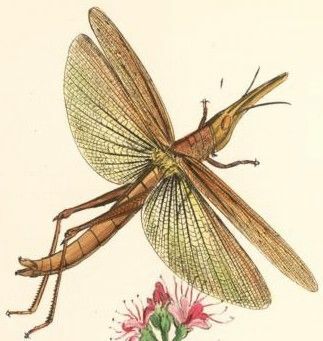 WESTWOOD J.O., 1841-45.- Arcana Entomologica, or illustrations of new, rare, and interesting Insects.- W. Smith, London, 2 vol., iv + 192 p., 48 pl. et 192 p., 47 pl. OPSOMALA GLADIATOR, Westw. (Pl. 17, fig. 1). longissimo, pedibus 4 anticis brevissimis. Long. corp. (rostro incl.) unc. 3 1/2 ; long. capitis unc.1, ante oculos unc. 3/4. Expans. tegm. Habitat Sierram Leonam. In Mus. D. Hope. rostrum forms a very sharp edge, and is slightly curved, the tip being obliquely truncate. sternum is armed with a short spine, and the meso- and metasternums are broad. Nº V.- 1st JANUARY, 1842.